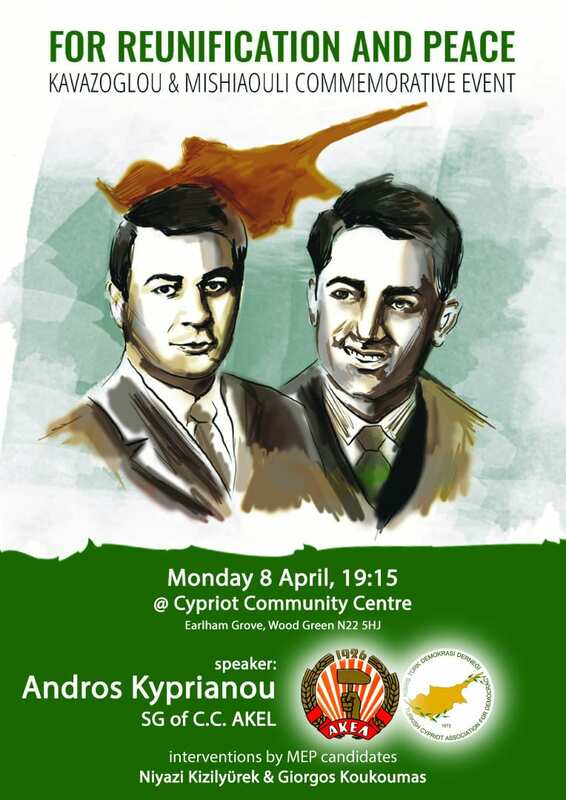 London event for reunification and peace: Dervis Ali Kavazoglou and Costas Misaoulis commemorative event was held on Monday 8th February 2019 at the Cypriot Community Centre, Earlham Grove, Wood Green, London N22 5HJ. Speaker Andros Kyprianou,Secretary General of AKEL. Other speakers were MEP candidates Niyazi Kizilyurek and Giorgos Koukoumas and Kakia Kakoulli. Artists that appeared were Andrew Hubbard and Mehmet Raif. This year 54 years will have passed since the cowardly assassination of comrades Dervis Ali Kavazoglou and Costas Misaoulis by extremists of the extreme-right wing Turkish Cypriot organization TMT. In one of the darkest turns of Cyprus’ History when chauvinism and bigotry took up arms to divide our people, when partitionist imperialist plans were drawn up and elaborated one after the other, the Peoples Movement of the Left, which was fighting for our country’s independence and the unity of our people, stood up and resisted these plans daily. Kavazoglou and Mishaoulis were devoted to this cause, to the struggle of our Cypriot people, Greek Cypriots and Turkish Cypriots, to remain united; to combat the hatred and fanaticism; to forge a wall of resistance to nationalism and strengthen the common struggle of the two communities for the salvation of their common homeland. Back then, you had to be bold and courageous to be a Kavazoglou. You needed courage to be a Mishaoulis. You needed faith and conviction, an uncompromising ethos and dedication to our people’s struggle. Despite constant warnings, our two comrades defied the dangers and death itself. Their murderers ignored the truth: they murdered them because they feared them. The fascists feared what Cypriots, united, would say and do. Today, though dead, they fear Kavazoglou and Mishaoulis even more because their murder was a sacrifice that inspires our people. AKEL in Britain paid homage this year too to the memory of the hero-martyrs Kavazoglou-Misaoulis who with their blood consolidated Greek-Turkish friendship. Their sacrifice became a symbol of rapprochement and the common struggle of Greek Cypriots and Turkish Cypriots for the reunification of our homeland.